Noted: There are 3 questions (23, 24, 26) were updated in 11 March, 2018. What is the minimum Ethernet frame size that will not be discarded by the receiver as a runt frame? What is a characteristic of port-based memory buffering? All frames are stored in a common memory buffer. Frames are buffered in queues linked to specific ports. All ports on a switch share a single memory buffer. Frames in the memory buffer are dynamically linked to destination ports. What is the aim of an ARP spoofing attack? What happens to runt frames received by a Cisco Ethernet switch? The frame is returned to the originating network device. The frame is broadcast to all other devices on the same network. The frame is sent to the default gateway. It defines the most common LAN type in the world. It is the required Layer 1 and 2 standard for Internet communication. It defines a standard model used to describe how networking works. It connects multiple sites such as routers located in different countries. Logical link control is implemented in software. Logical link control is specified in the IEEE 802.3 standard. The LLC sublayer adds a header and a trailer to the data. The data link layer uses LLC to communicate with the upper layers of the protocol suite. The LLC sublayer is responsible for the placement and retrieval of frames on and off the media. What statement describes a characteristic of MAC addresses? They must be globally unique. They are only routable within the private network. They are added as part of a Layer 3 PDU. They have a 32-bit binary value. Which statement is true about MAC addresses? MAC addresses are implemented by software. A NIC only needs a MAC address if connected to a WAN. The first three bytes are used by the vendor assigned OUI. The ISO is responsible for MAC addresses regulations. Which destination address is used in an ARP request frame? 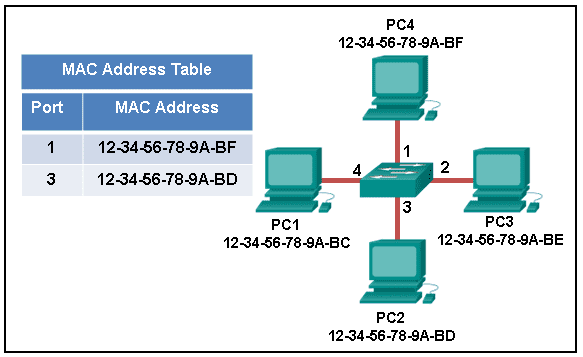 What addressing information is recorded by a switch to build its MAC address table? Refer to the exhibit. The exhibit shows a small switched network and the contents of the MAC address table of the switch. PC1 has sent a frame addressed to PC3. What will the switch do with the frame? The switch will forward the frame only to port 2. The switch will forward the frame to all ports except port 4. The switch will forward the frame to all ports. The switch will forward the frame only to ports 1 and 3. Which switching method uses the CRC value in a frame? When a device is sending data to another device on a remote network, the Ethernet frame is sent to the MAC address of the default gateway. 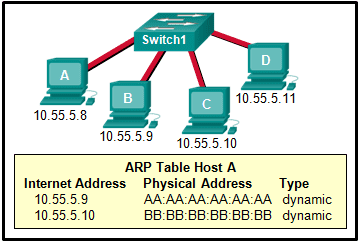 The ARP table in a switch maps which two types of address together? PC2 will send an ARP reply with its MAC address. Refer to the exhibit. A switch with a default configuration connects four hosts. The ARP table for host A is shown. What happens when host A wants to send an IP packet to host D? Host A sends an ARP request to the MAC address of host D.
Host D sends an ARP request to host A. Host A sends out the packet to the switch. 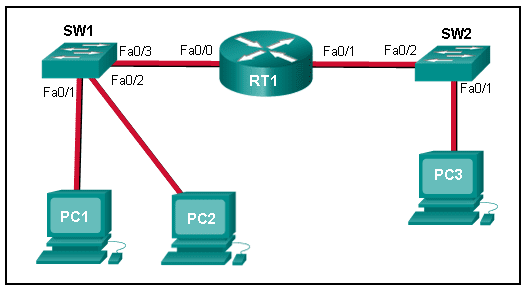 The switch sends the packet only to the host D, which in turn responds. Host A sends out a broadcast of FF:FF:FF:FF:FF:FF. Every other host connected to the switch receives the broadcast and host D responds with its MAC address. Refer to the exhibit. The switches are in their default configuration. Host A needs to communicate with host D, but host A does not have the MAC address for its default gateway. Which network hosts will receive the ARP request sent by host A? Which statement describes the treatment of ARP requests on the local link? They must be forwarded by all routers on the local network. They are received and processed by every device on the local network. They are dropped by all switches on the local network. They are received and processed only by the target device. Manually configuring static ARP associations could facilitate ARP poisoning or MAC address spoofing. On large networks with low bandwidth, multiple ARP broadcasts could cause data communication delays. Network attackers could manipulate MAC address and IP address mappings in ARP messages with the intent of intercepting network traffic. Large numbers of ARP request broadcasts could cause the host MAC address table to overflow and prevent the host from communicating on the network. 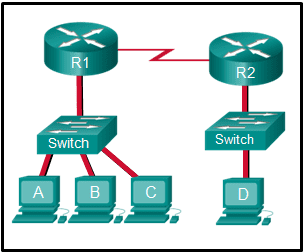 Multiple ARP replies result in the switch MAC address table containing entries that match the MAC addresses of hosts that are connected to the relevant switch port. ARP spoofing is a technique that is used to send fake ARP messages to other hosts in the LAN. The aim is to associate IP addresses to the wrong MAC addresses.